We live in a giant social-economic experiment that swings to the left or to the right depending upon which party is in control. From the 2008 Presidential election results by county, it is obvious that the people of America’s heartland have a different opinion of how the country should be governed than the big cities and the Northeast. Unfortunately, you can’t easily leave that experiment if it is going in the wrong directions. No matter what the politicians promise, NOBODY knows how their actions reduced or lengthened the current recession. There is no way of telling if the Obama stimulus plan or any other actions by this or any other administration affect the nation’s vitality, employment, or the welfare of its citizens. The only way of truly knowing the effects of government’s actions is to set up identical twin governments and not do those actions. Fortunately we already have 51 nearly identical governments and proclaim that as much power should be transferred to those governments so THE PEOPLE can determine how to deal with these social issues. It is extremely clear that no matter how great of crisis is facing America (war, financial crisis, energy crisis, etc), there are voting citizens who are only concerned with electing candidates who address these three issues according to their shared beliefs. As a result, the candidates in both parties are becoming more and more extreme Left or Right. In fact, the Republican Party has splintered into moderate and a far right fraction known as the Tea Party. It should be quite obvious that no matter whom either party elects to office, only minor changes in public law are going to take place. It is quite obvious that neither side will ever obtain a super majority needed to create nationwide laws that suit only one side. It should be quite obvious that temporary majorities are obtained by either side making huge concessions to 3rd party members who representing small minority groups. Remove all laws concerning abortion from the federal government jurisdiction and move it to the states. Citizens in each state would be free to create extreme Pro-Choice or Pro-Life laws as well as Gay Rights Laws according to the wishes of the citizens in their state, but they wouldn’t be able to create laws on the matter for people living outside their state. The ACLU (with Gay and Atheists) has long argued the Establishment Clause to mean the government can not DISPLAY any type of religion when the Establishment Clause actually said the government could not make any laws which endorsed a national religion or prevent the free exercise of a religion. How can displays of "anti-religion" by government officials not violate the Establishment Clause? WE SAY: Atheism is a religion and also we say a government official that conducts a gay wedding on the courthouse steps is endorsing an “anti-religion”. WE SAY: Courts that side with the ACLU and atheists to remove religious symbols from public land is a direct violation of the Establishment clause because they are promoting one religion (Atheism) over another religion (Christianity). 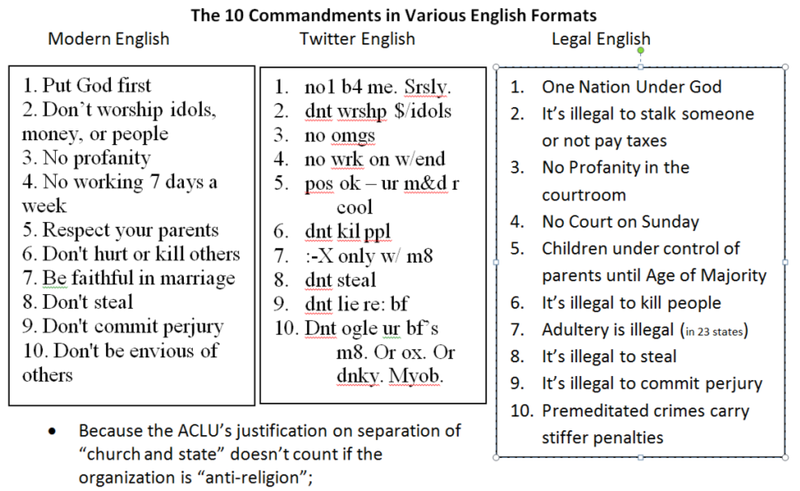 The ACLU have made such a big deal about the 10 commandments being a religious display, but the 10 commandments are part of our laws. I have presented three versions of the 10 commandments for your review. If any of these three formats are not offensive then how could any of them be offensive? WE SAY: It is for all of these reasons why all funding of the ACLU must end! When contacting an attorney, find out if they are ALCU member and choose someone else. In addition, for the reasons stated above, the ACLU must not be supported by our state tax dollars at state colleges and universities. While no state money may be going directly to the ACLU, according to the separation clause of the 1st amendment, there should not be any display of the ACLU on public land; meaning no offices in University campuses and no ACLU signs displayed on campus walls.